Heat pan and add 1sp oil Slightly roast paneer slices on both the sides till golden brown or crisp. Do the same with bread slices. And add green chutney on both the slices. 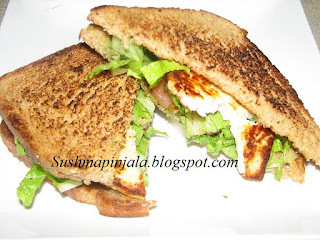 Now on top of the green chutney add tomato clices, onion slices paneer slices and chopped lettuce. Cover with another bread slice and cut into half. Serve. 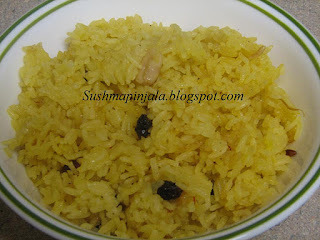 Also sedning this recipe to Vardhini's New "u" event. Add Ajwain and salt to maida and mix well. Add enough water to make a stiff dough. Cover with wet paper towel and keep aside for 15 minutes. Heat pan and add oil. 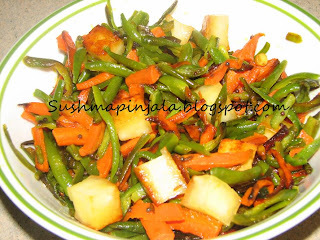 Add chopped onion, capsicum/ bell pepper and fry for few minutes. Add chopped tomato and cook well. Now add salt, chili sauce, soy sauce and mix well. Now add grated paneer and mix. Make the dough to 5 equal size balls and roll out as round chapati. Make it to half and fold as shown below. Close from 2 ends and make as triangle. Make it as cone and fill in the curry and seal it. 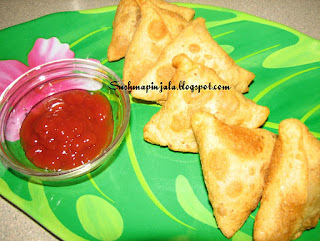 Now deep fry the samosa's and serve hot with ketchup or any chutney. Grate paneer and keep aside. Heat pan and add 1sp oil and add chopped palak and green chilies. Cook and grind it to smooth paste. DO not add water. Now heat non stick skillet or tava. Meanwhile add salt to dosa batter and mix well. Now add 1/4 cup dosa batter on pan and spread it with the spatula as shown below. Now add 3sps of spinach paste on top and spread. Also add grated paneer. 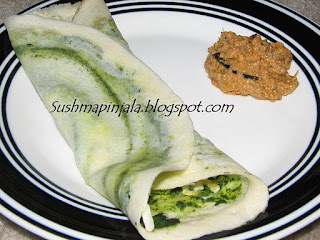 Cook for 2 minutes and flip around to cook on other side of dosa. Now remove and serve hot with any chutney. Also sending this recipe to Vardhini's New " u" event. Heat oil in a pan and add cumin, mustard, chana dal, curry leaves and fry till mustard seeds splatter. Now add sliced beans and carrot. 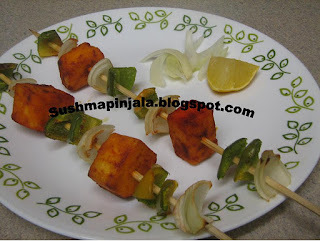 Cook for few minutes and add paneer cubes. Mix well and add haldi, chili powder and salt to taste. Cook for few more minutes and remove. Serve hot with roti or chapati. Soak the skewers in water for 30minutes. Cut capsicum and onion into bite size pieces. Cut paneer into bite size cubes. Marinate paneer with curd, tandoori powder, cumin powder, chat masala,chili powder, salt and gingar garlic paste and keep aside for 2hrs. Arrange the capsicum, onion and paneer pieces in between. Back in oven for 15 minutes on 350 degrees F. Remove and serve hot with sliced onion and lemon. Sending this Recipe to Vardhini's New "u" event. Add water to wheat flout to make a stiff dough. Grate paneer and add ajwain, chopped onion, cilantro, chili, salt and chili powder. Mix well and make it to 6 equal size balls. Make 6 equal balls with wheat dough too. Now make medium size chapati with one ball and place the paneer ball in the middle and cover with all sides. Now slowly make this as chapati andcook on hot tava / pan till golden brown. 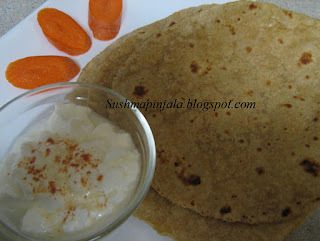 Add little ghee or oil to the roasted paratha and serve hot. Cut paneer into long strips about 2 inches length. Deep fry these strips in oil till golden brown and keep aside. Now add salt, garam masala, soda and chili powder to besan and mix with water to smooth batter. 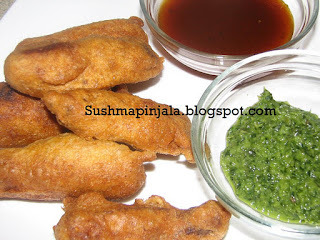 Now dip these fried paneer strips in besan/ gram flour mix and deep fry till golden brown or till crisp. 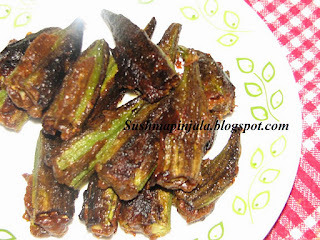 Serve hot with Geen chutney or sweet chutney. Soak rice in water for 30minutes. Heat pan and add ghee. Add cashew and raisins and saute for till raisins puff up. Remove and keep aside. Add soaked rice and saute till rice separates. Now add 1 1/2 cup of boiling water and saffron strands. Cook till half done and add sugar. Cook till rice is completely cooked. Now add cardamom powder , fried cashew and raisins. Serve hot. Mix wheat flour, besan( gram flour), oil, salt, coriander powder, chili powder, cumin and ajwain. Mix well adding water to stiff dough. Roll into small roti's and roast on tava. 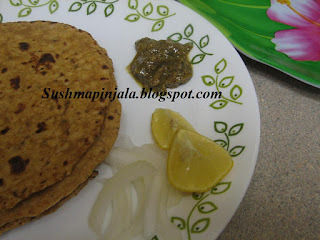 Brush each roti with melted ghee and serve hot with any curry or pickle. 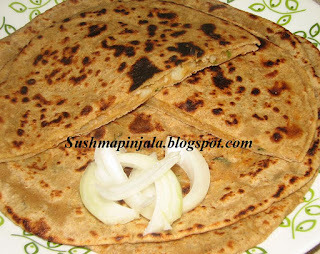 I have served hot roti's with chili lime pickle and onions. Boil and peel the skin of potato's . In a small pan heat oil and add chopped onion and green chili. Saute till onions turn into golden brown. Now add mashed potato, chili powder, salt, cumin powder and mix well. Now add chopped cilantro and serve hot with roti or rice. I have served this aloo bharta withkhasta roti. Heat the pressure cooker and add oil. Once the oil is hot add whole garam masala. 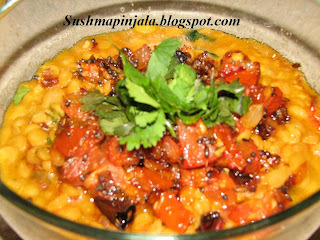 Saute for few minutes and add washed and drained chana dal. Add grated coconut and 4 cups water.. See that the dal doesnot become mushy. Now prepare the tempering, heat small pan and add oil. Now add cumin seeds red chili and mustard seeds. After a minute add chopped ginger, garlic and onion and cook till onion becomes light brown. Ad d chopped tomato and cook for 4-5 minutes. Now add this tadka or tempering to the cooked chana dal and mix well. Serve hot with rice or roti or poori. Wash and wipe the bhindi. Cut off the ends and slit on 1 side. Except onion seeds and cumin seeds, mix everything in besan. Also add 1sp oil and salt. Now fill this mixture into slit bhindi. Heat pan and add 2 spoons oil, add cumin seeds, onion seeds, chopped green chilies and fennel seeds. Saute for a minute and add bhindi. Cook on medium flame for 10 minutes. Cover with lid and fry till crisp. 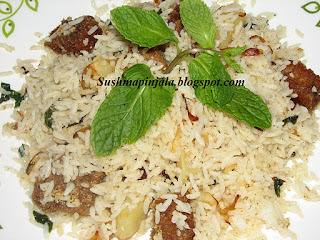 Serve hot with rice or pulao. Add carrom seeds, garam masala, salt, chili powder, sooji and oil to wheat flout and mix well. Add water to make a stiff dough. Divide to 8 equal balls and make as chapatis with rolling pin. 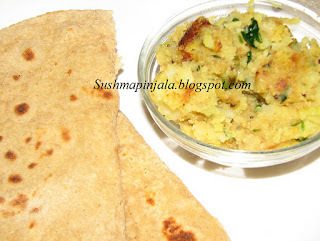 Heat tava or pan and place the roti , and cook on medium heat on both sides. Remove and serve hot with raita or plain curd.